The world’s biggest wine festival is held each year in Bad Dürkheim, Germany. Held during the second and third weekend of September, Wurstmarkt hits an important milestone year. 2016 will mark the 600 year occurrence of this popular wine festival. The very first German wine festival was held way back in the year 1417. Wine making is big business in Germany. The European country has thirteen different wine growing regions. 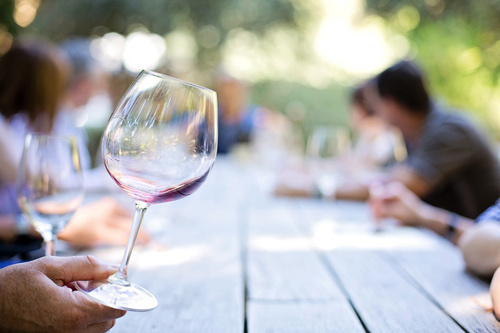 The regions produce incredible wines ranging from crisp Riesling wines to a floral Pinot Noir. What is interesting is that the wine festival’s name – Wurstmarkt – translates to sausage market. Most people don’t associate wine and sausage together. The town of Bad Dürkheim is located in the premier wine-growing state, Rhineland Palatinate. The legend of how Wurstmarkt got its name is due to the large amounts of sausage that was eaten during the early years of the wine festival. Now it’s the World’s Biggest Wine Festival and people attend from all around the world. It is expected that greater than 600,000 people will attend this year’s wine festival in Germany. Be sure to check out the Giant Cask, named Dürkheimer Riesenfass. It’s known as the biggest wine barrel in the world. Surprisingly, it even includes a restaurant inside. Wine connoisseurs can try about 300 award-winning wines and sparkling wines. In addition to the many food and drink stands, plan on enjoying the various fairground carnival rides. There will also be music concerts and spectacular fireworks displays. This is an amazing cultural experience that should not be missed, especially for wine lovers. This year’s Wurstmarkt wine festival will be held on the consecutive weekends of September 9 to 13 and 16 to 19. Be sure to attend Wurstmarkt in Germany at the World’s Biggest Wine Festival. Contact The Life of Luxury today for help booking your luxury travel itinerary. Come back again to follow our luxury blog and read about other popular events from around the world.